160-page, full-color soft-bound edition! Features the latest rule updates, including those made in the Pinnacle hits Deadlands: Reloaded? as well as the licensed products Pirates of the Spanish Main and upcoming Savage World of Solomon Kane. Beautiful full-color art from current and upcoming Savage Worlds settings as well as all new pieces grace the 160 pages of Origins Award-winning text. 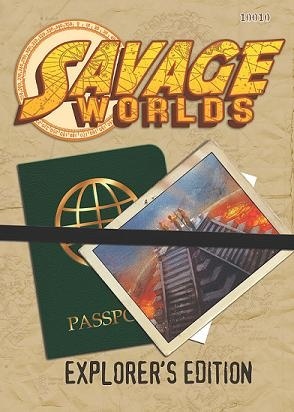 The Savage Worlds: Explorer Edition contains everything a player or Game Master needs to run a Savage Worlds session including: full rules for character creation, combat, monsters, world building tips, and an all new swashbuckling Savage Tale penned by Savage Worlds and Deadlands creator Shane Hensley.